I finally got a little bit of time to sew my very first maternity shirt (yay!). I'm carrying pretty low so most of my pants no longer fit and I've had to make the switch to maternity bottoms. I can still fit my longer casual t-shirts and tank tops, but am beginning to need some dressier tops for work. Enter the ubiquitous Sorbetto top from Colette patterns which was first made available on the totally awesome Grosgrain blog. 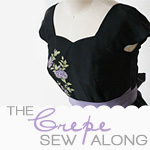 Since then, the sewing world has been on fire with creations of this adorable top. It's super cute, and so easy to put together. Not to mention its simple design can be adapted in so many ways to make a completely different top. Now I liked the Sorbetto the second I laid eyes on Sarai's photos... But it wasn't until I saw the 7 Days of Sorbetto challenge on Sew Weekly's blog that I truly realized what a versatile pattern it was. Seriously, Mena is amazing! Check out her stuff here. But the top that really got me excited was the Sorbetto she liked the least. I like her version a lot, but also really really like the inspiration for her version. I love the bow on the front - it's so sweet! I am also a huge fan of tie-front blouses. So I decided to create my own version. I had a nice magenta bamboo jersey in my stash that I picked up at Dressew a while back... like before we even thought we might be moving to the coast... It's really nice and soft, and works nicely with the style of top. I didn't need to make many alterations to the pattern in order to make it maternity. I cut out a size 4 based on my preggo bust measurements and then used the length of a size 18. Next time I make this pattern I will probably add another inch or so to the length as this one now sits just below my belly... Like I said - I'm carrying really low! The original version from Colette patterns has a box pleat detail running down the front. I kept this extra fold of fabric when I cut out my version but only gathered the pleat at the neckline, allowing the extra room for the body. I also skipped the bust darts since my version is less fitted than the original. I drafted a collar with long tie pieces, and used the Dirndl sleeves from my Built By Wendy Dresses book to turn the camisole into a blouse. Since the bamboo knit was kind of going all lumpy when I used the stretch stitch on my machine, I decided to go with it and added a bit of thin elastic to help gather the sleeves. I also decided to use some elastic on the bottom of the blouse so it would snug up under my belly and help show it off a bit more. I'm happy that I'm finally looking pregnant and not like I've been drinking too much beer, lol. My next projects include: a pair of maternity denim shorts that I can wear for my other job (it's more casual plus I have a uniform shirt to wear - and it still fits! ), and possibly some capris as we are into September now. Not to mention several more blouses, a dress and hopefully a couple of skirts. I will also need to come up with some sort of jacket to get me through the cooler months. January is on its way! And I'd better get ready!